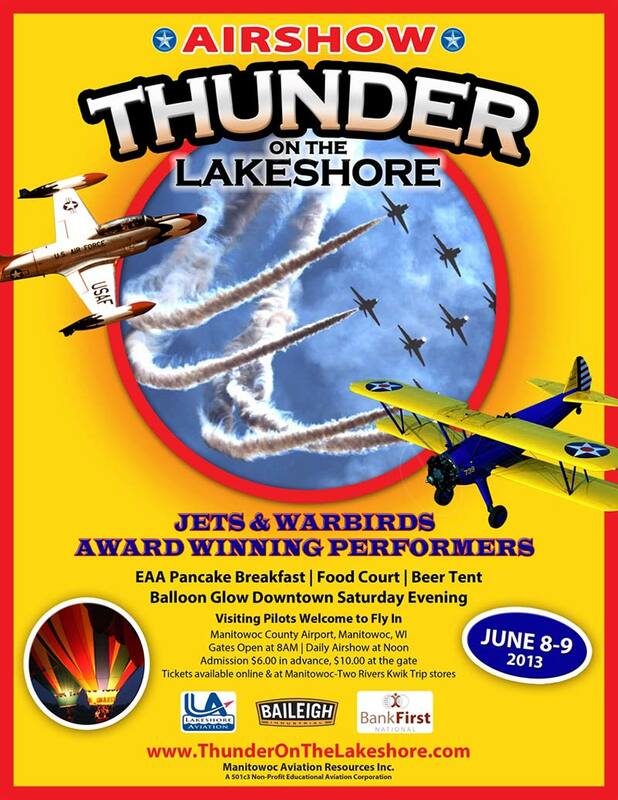 As an annual summer weekend airshow in Manitowoc Wisconsin, Thunder on the Lakeshore was an incredible event for only a $10 entrance fee. The airshow was presented by Manitowoc Aviation Resources, Inc., a non-profit 501c3 educational corporation providing aviation education to students in northeastern Wisconsin. 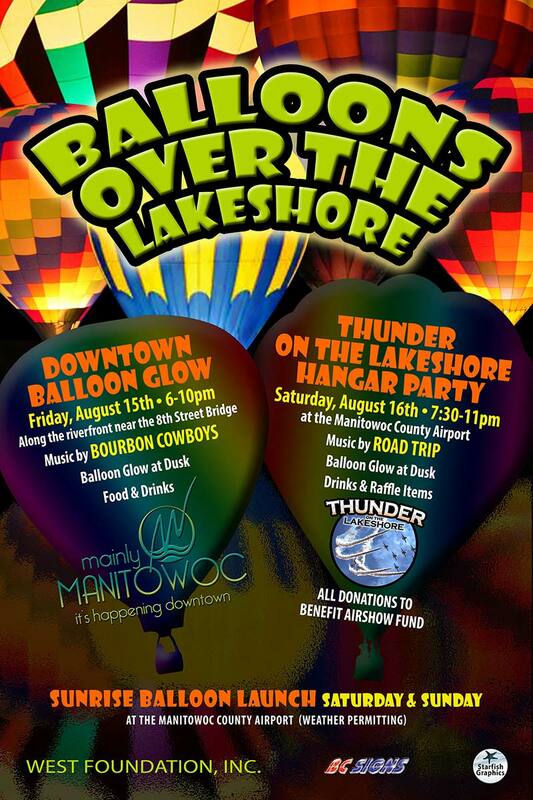 Food, fun, and music including the "Ladies for Liberty"
5-10pm - Live music under the Big Top Tent! 1:00pm - Airshow begins - Acts include a mix of civilian piston airplane and jet performers and RC airplanes. 4:30pm Airport closes to public crowds, normal operations resume. See the beautiful Beech 18, Electra Jr., Tuskegee Airmen, historic warbird airplanes, and other static exhibits. Chat with pilots, airplane owners, and other performers, stop for breakfast at the EAA building or lunch from the food tent or various food vendors, and purchase something special from one of the merchandise vendors. View the static airplanes (but don't touch!) and speak with their pilots to get a taste of how exciting aviation can be. Take to the skies yourself with an airplane ride from Lakeshore Aviation, available at a very reasonable rate for the show only. Or catch a helicopter ride. Stop by the USTA Smash Zone exhibit and try your hand at Wii tennis or have your child get their first tennis lesson. You can only do this from the grounds of the airport, and, what better place to position yourself for some of the best Airshow entertainment possible! New this year is a 1/3 scale F117A "Nighthawk" Stealth Bomber replica – as part of the Stealth for Kids USA Exhibit. Children will have the opportunity to get their photo taken in the model, affording the opportunity for a fun keepsake. Listen for the amazing music of the Ladies for Liberty at the flag ceremonies right before the start of the show. These wonderful ladies are a singing troupe dedicated to performing Andrews Sisters Style music through their own rendition of vocals, costumes, hairstyles and wardrobes reminiscent of the 1940's. Our children's area is always a good time with many different types of exhibits. Some are educational and some are just fun! Another new exhibit will be the USTA (United States Tennis Association) Smash Zone Mobile exhibit. SmashZone Mobile includes a 53-foot trailer, and has features four kid-sized tennis courts for youth play. Courts will feature games such as Xerox Rally Court, racquet drills and activities, as well as a target challenge. The trailer itself, which is handicap accessible, will feature activities that include a Tennis Magazine Green Screen Cover Shoot, Wii Tennis and Touch Screen Kiosks. SmashZone Mobile is a complement to the USTA's successful youth participation initiative, 10 and Under Tennis. 10 and Under Tennis is an ongoing effort to encourage young people to get active by playing tennis. We are honored to host this exhibit, and thanks go out to the USTA for bringing it to our show. Returning this year is Bill "Magician 500" Hunter. Bill is a magician known to many as the "Indy 500 Magician." Hunter has performed for the past 41 years for race car drivers and sponsor parties at the famed Indianapolis Motor Speedway. Hunter has entertained and become friends with a long line of celebrities, including Movie Stars, TV stars, Astronauts and a variety of famous people. Everybody loves some magic from time to time, so look around the crowds for Bill and you will be delighted with this performance. Once again, the City of Manitowoc Police Dog Canine unit will hold demonstrations at 11:00 Saturday and Sunday. This demonstration will feature handlers and dogs that work real life drug busts, rescue missions, and criminal investigations. It is an unforgettable sight to see these beautiful dogs work through the commands that their expert handlers give to them. After working hard on the job, these dogs are eager to head home with their handlers and be great family pets during their time off duty.